Hey there crafty friends, I hope everyone is having an awesome day. Aren’t bunnies just the cutest? 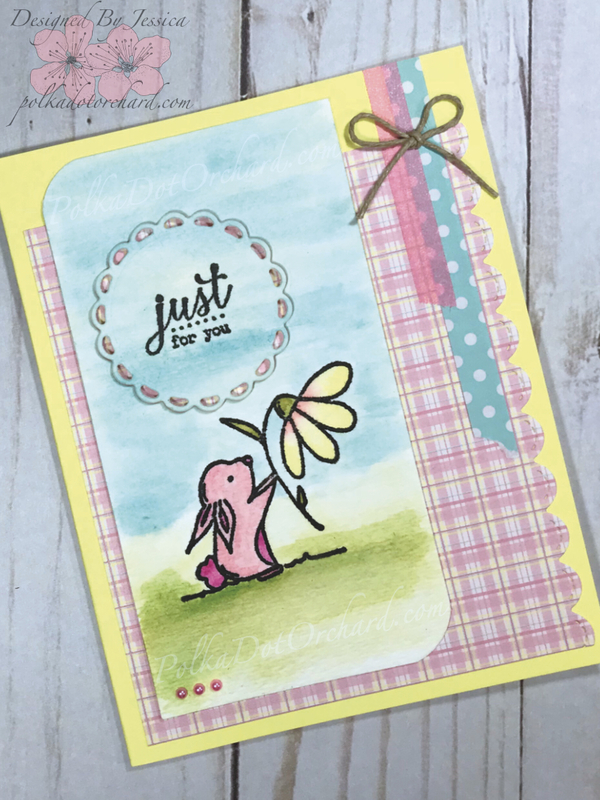 Especially this bunny from Unity Stamp (called Little Bunny for You). This card is super cute and super easy to make. The image and sentiment were stamped on Canson XL watercolor paper with my MISTI using Versafine ink. I then used Tim Holtz distress inks to watercolor it. To do this I pressed each color onto an acrylic pad and sprayed it with water. After I was done painting it I used a pretty round scalloped die and a Sizzix BIGkick to cut the sentiment from it and later popping up that sentiment from the card using some fun foam. Also, using my corner chomper I rounded two corners of the painted image. After digging through all my scrapbook paper I’ve been hoarding for years, I found the perfect piece. A pink and yellow with a hint of blue plaid patterned piece. I first trimmed it down to size for both the front and inside using my cutterpillar. I then went back to my sizzix machine with my paper and my favorite dies from Lawn Fawn, the scalloped stitched border die set, and made the edges all pretty. I attached all paper to my yellow Recollections cardstock base using my atg tape gun, which I absolutely love. The painted image with the plaid paper looked so pretty as is that it only needed some minor embellishing, so I glued some itty bitty flatback pink pearls to the left corner of my paint bunny image using some Tim Holtz Multi Medium Matte glue. Then finshing up the front with some washi tape and a little bow made of twine. What about the inside of the card? You ask… Well, lately here, even though it takes more time, I have really enjoyed making the inside match the outside. This is easy peasy! I matted the inside with the same plaid patterned paper from the front. 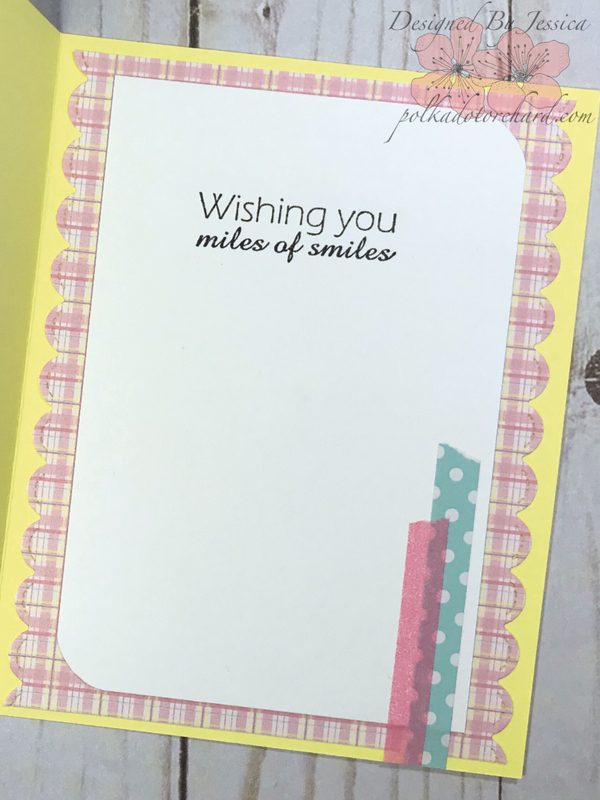 I then corner chopped two corners of the cardstock with the sentiment “Wishing you miles of smiles” and attached it on top of the plaid paper, just as I did with the bunny on the front. Finishing it up with a couple strips of the same washi used used earlier. Thanks for visiting Polka Dot Orchard! That bunny is so sweet holding up that flower and your coloring is wonderful. I also like that you’re sharing the insides with us . It’s great to see the front but the inside really ties it all together… So lovely!! !